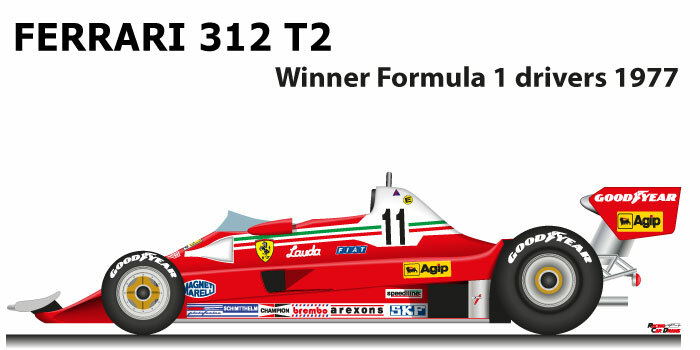 The Ferrari 312 T2 n.11 is the winning car of the Formula 1 World Championship in 1977. Designed by engineer Mauro Forghieri in 1976, it was an evolution of the Ferrari 312 T winner in 1975. With limitations imposed by the regulation, they disappeared the large air vents above the pilot’s head. In 1976, due to the Lauda accident at the Nurburgring, the Austrian rider lost the world championship for one point, against the English driver James Hunt with McLaren M23. Niki Lauda with the Ferrari 312 T2 n.11 won the 1977 World Championship of F1, for the Austrian rider was the second world title. Despite the rise of the Lotus, the Ferrari driver won three Grand Prix: South Africa, Germany and the Netherlands, but also won many second places that allowed him to celebrate the title at the Italian GP. Lauda obtained the victory had long been in disagreement with Enzo Ferrari and decided to leave the stable of Maranello and in the last two races remained the Drake debuted a young Canadian driver, Gilles Villeneuve.